So this recipe is pretty simple and doesn't really require a whole lot of explaining. As you can tell from the name and photos, they are delicious. The hardest part will be making the crepe batter (and even that is not hard). 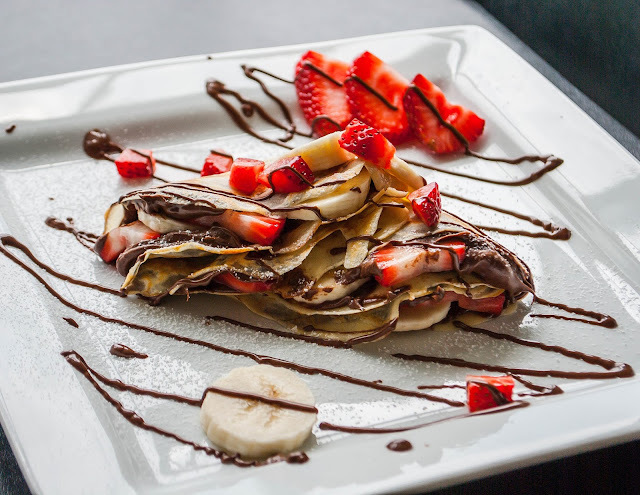 Note: these crepes are coated with Nutella on the inside. If you are looking for something less sweet, I would skip coating the inside and instead just drizzle some Nutella on the top. Mix together eggs, milk, water, and melted butter. Add salt and sift in the flour. Stir to combine and until smooth. *Optional: it is recommended to let the batter rest. You can let it rest for up to one hour, covered in the fridge. This helps to reduce bubbles, which helps to reduce tearing during the cooking process. Coat a frying pan with butter (be sure pan is coated before each crepe) and heat on medium. Once pan is heated, scoop about 1/4 cup of the batter into the pan. Swirl pan around in a circular motion to coat evenly. Cook for about 45 seconds, or until the bottom starts to turn a light golden brown. Flip with a spatula and cook for additional 15 seconds.